Hi, we are Ines Stoll and Mark Dittke from The Purple Dog Self Catering House in Greyton in the Cape Overberg, Western Cape. 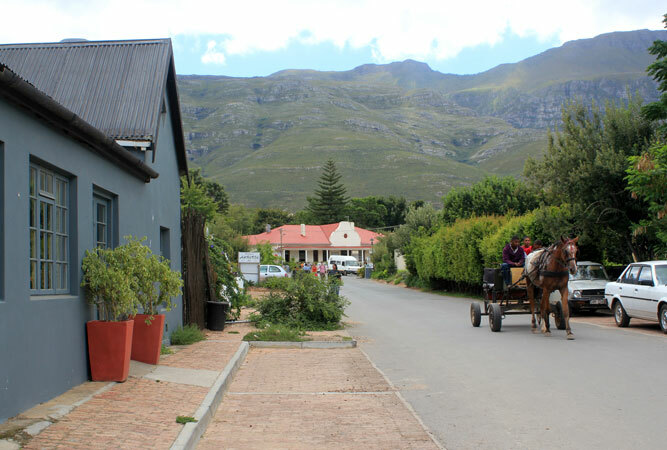 Greyton IS BEST KNOWN FOR its magnificent piece of peace, tucked away from the N2 but still close enough to Cape Town with its oak tree lined streets surrounded by the majestic Riviersonderend Mountains. GET YOUR PICTURE TAKEN whilst meandering in the Nature Reserve along the Gobos River with an easily accessible waterfall or from the top of the Mountain whilst hiking the Loerkop Trail with a marvellous 360-degree view with the whole chain of the Riviersonderend mountains spread from east to west, with Greyton and Genadendal in sheltered positions. While on this path, scanning the surrounding hills with binoculars may also reward you with the sight of some antelopes, probably the Grey Rhebok/Reebok, and with some luck also blue cranes, indigenous to this area. So keep your camera ready to shoot. THE BEST still life PICTURES CAN BE TAKEN on the Knietjieshoogte Walk, from the bench at the highest point of the walk, affording not only wonderful views of the surrounding mountains and area, with glimpses of Boschmanskloof in the west and a glimpse of Genadendal in the distance, but also from beautiful colourful flowers in all sizes encountering along this path like proteas, ericas and several spring flowers. OTHER HAPPY SNAPS all over the village… including the picturesque restaurants and shops and the Saturday morning market. WHEN THE WEATHER’S GOOD, WE LIKE TO trail run, go hiking and mountain biking on the numerous trails of all difficulties Greyton has to offer. Many of the Cape Epic riders consider Greyton as one of the best MTB territory in South Africa (in 2014 Greyton was included as one of the stages). The trails range from family friendly to more strenuous. WHEN THE WEATHER’S BAD, I still like to trail run as I cannot resist the beauty of the surroundings. My reward will be sipping a red wine beside a crackling fire, curl up with a good book, or have friends over for delicious dinner which has been cooked by Mark in the meantime. WE THINK THE BEST TIME OF YEAR TO VISIT IS November, because the spring display of colouring flowers is quite spectacular, the weather is mild and clear. But anytime in the summer is perfect for braaing and hanging out with friends and the winter is filled with cold but sunny days. Sometimes there is even snow on the mountains which calls for cosy log fires and an abundance of Von Geusau chocolates. OUR FAVOURITE BREAKFAST SPOT IS Via’s Deli as they offer good healthy wholesome breakfastswith the best cup of hot chocolate, a meal in itself. It is also a WiFi Spot. 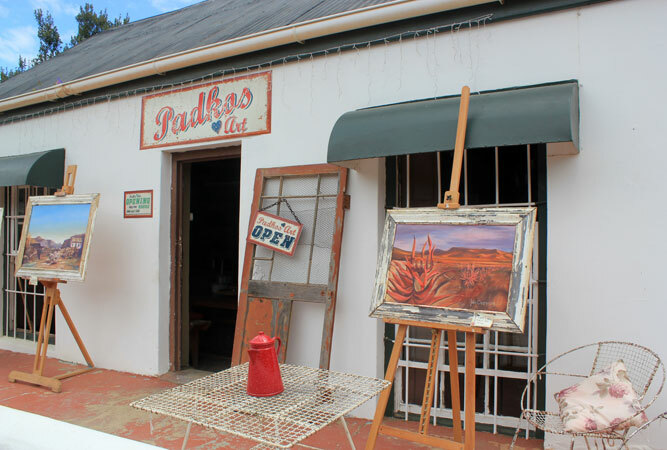 FOR LUNCH, WE SUGGEST Searle’s Trading Post with its fancy Décor/gifts/antiques/bric-a-brac/deli and something unusual from the past. 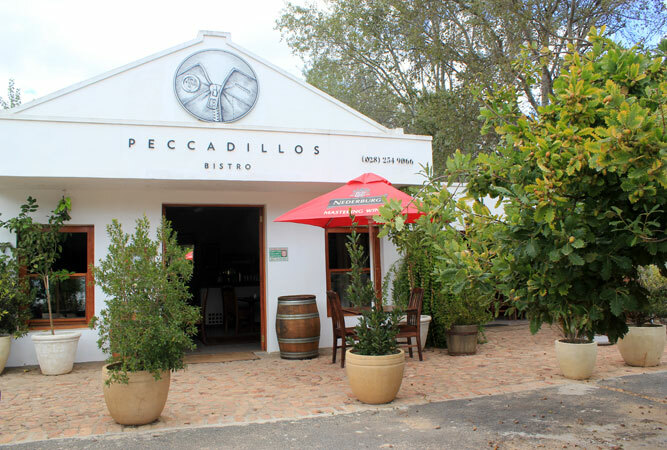 Good food in a varied atmosphere (cosy fire place inside for cold evenings and big outside area for sunny days) where most furniture and other accessories are for sale. Our favourite: mouth-watering beef fillet medium rare and great pizza for the kids! OUR FAVOURITE RESTAURANT IS The Hungry Monk as they serve a nice selection of tapas in a comfy artistic atmosphere. 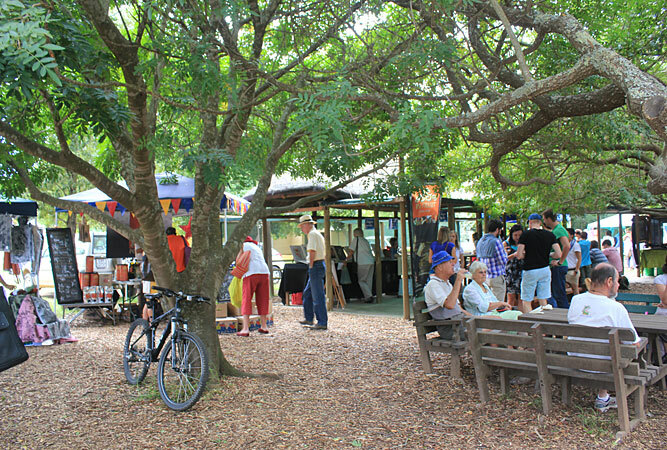 IF YOU WANT TO MEET LOCALS, GO TO the Saturday morning market or if you are an early bird and of the active kind join the local MTB enthusiasts on a Saturday morning. 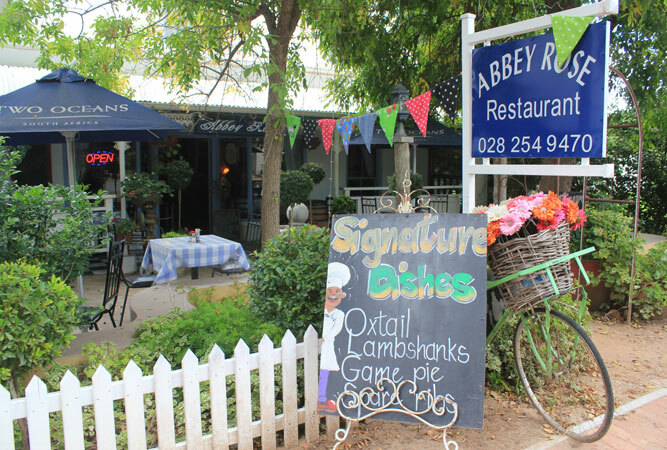 GREYTON’S BEST KEPT SECRET IS that you get addicted to it. Maybe the secret lies in the fact that it always feels like being away for weeks even after a quick weekend as the village, nestled in a kind of cul-de-sac road at the foot of majestic mountains just has its own arty character. It doesn’t come without a reason that many visitors wish to buy a house here after their first visit(like we did and rent it out ever since to share this treasure). MY FAVOURITE THING TO DO WITH FRIENDS IS to first hike, shower in the garden with the hose thereafter and to end with a sumptuous meal together. Mark prefers cycling his lungs out, sipping a coffee at Oak & Vigne and cooking up a storm for dinner. FOR SOME LIVE MUSIC, we always look forward to the annual Greyton Classic for All Festival which takes part at the end of May/beginning of June. The festival’s focus is on classical music concerts, but there are also workshops, a concert for children, art exhibitions, wine tastings and various food events. IF YOU’RE FEELING ADVENTUROUS, go 4×4 with your car, run or get on your bike to do mountain biking. Once you are hooked it does not matter if the weather plays along and provides perfect conditions or not at the annual Greyton Classic which is a popular annual top event mid June for mountain bike riders (47km) and runners (21km and 10km)alike. Alternatively take part in the Greyton Tour which is a non-competitive 2 day MTB stage event at the end of August. 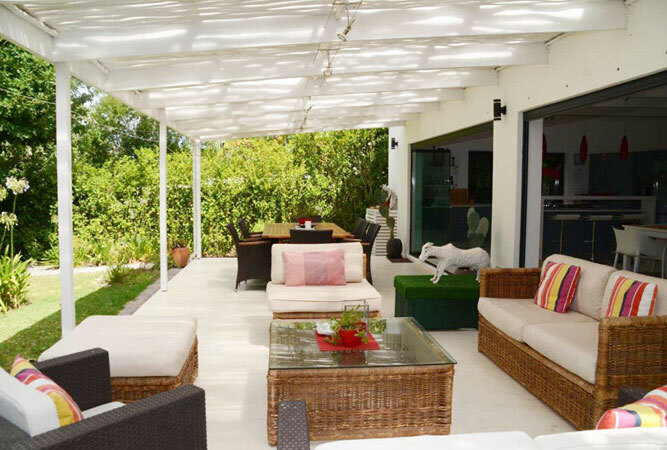 TO RELAX AND RESTORE MY SOUL, WE LIKE TO sit on the stoep, enjoy the surroundings and feel so privileged having the opportunity to escape hectic Cape Town on some weekends. MY FAVOURITE HIKE is from McGregor to Greyton on a Friday and hiking back on a Saturday. It is 14km long and winds up through the only gap in the Riviersonderend Mountain Range, also known as the Boesmanskloof Traverse. During the 1920’s there was an attempt to link Greyton with McGregor by way of a road. Portions of this road survived which now form part of the Boesmanskloof Trail. It requires five to seven hours of walking both days. During the summer there is nothing better than to take a refreshing swim in the rock pools.In winter though snow on the mountains make this a very frosty option.But if you wear the right clothing nothing will stop you. OUR FAVOURITE GALLERY IS David Kuijers’ Gallery. David was studying Graphic Design and majored in illustration. David’s work, incorporating clean cut lines and vibrant colours, is well known throughout the greater Cape Town area. Guess who drew the PURPLE DOG? TRAVELLING WITH CHILDREN? A FUN OUTING IS a picnic on the banks of the Gobos River and build sand castles. Or taking the “donkey-taxi” to meander through the village on a Saturday morning. If you want to go for a doddle on your bicycles with the kids check out the Rockhopper Forest for real fun riding without the hills! WHEN WE WANT TO GIVE BACK TO THE COMMUNITY, we support our local Red Cross, Animal Welfare and Nature Conservation societies. 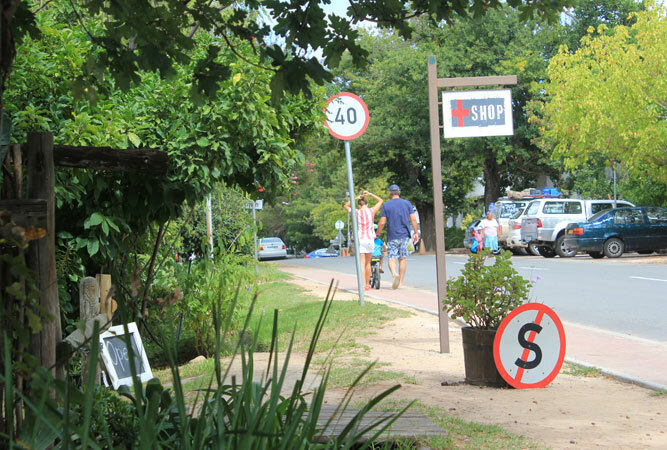 We Love Greyton BECAUSE there is something for everyone, at any time. There is fun for all, no matter if young, old, active or not so energetic. Greyton caters for culinary bon vivants, fauna and flora lovers (Greyton Rose Fair in October) and for the outdoor enthusiasts who may enjoy many kilometres of hiking and cycling tracks through stunning scenery.We just love it for its pristine environment, surrounded by magnificent natural beauty, the amazing community spirit and the peace and tranquility which we will gladly share with guests.